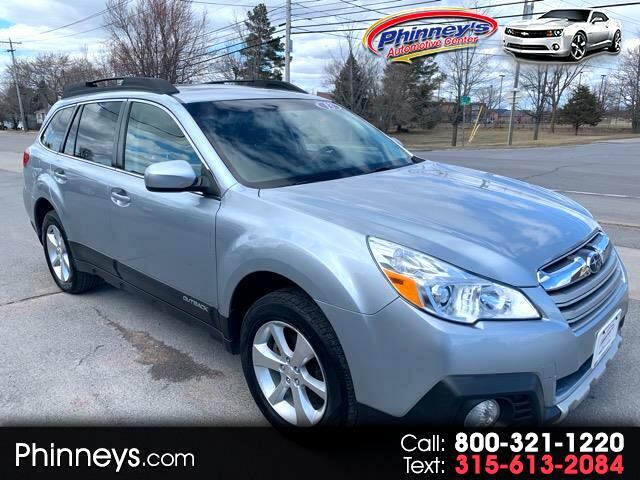 One look at our refreshed 2013 Subaru Outback 2.5i Limited displayed in Ice Silver Metallic and you will know why it is considered Subaru's flagship. Like the Legacy on which it is based, our Outback Limited has a sporty feel made so by the steering wheel mounted paddle shifters. The 2.5 Liter 4 Cylinder that puts 173hp at your disposal connected to Subaru's own CVT achieving 30mpg means you can go farther for less. Our Outback Limited includes standard Symmetrical All Wheel Drive which makes it ready for any weather with its sure-footed stance. Professional photos reveal a spacious cargo area with an excess of head/leg room, even in the backseat. Our Outback Limited includes standard amenities like leather seating surfaces with heated front seats, a Harman Kardon sound system, dual climate control and plenty of things that just make sense. With all around visibility, over 8 inches of ground clearance and a low center of gravity you'll feel like your piloting a sports car through any weather!